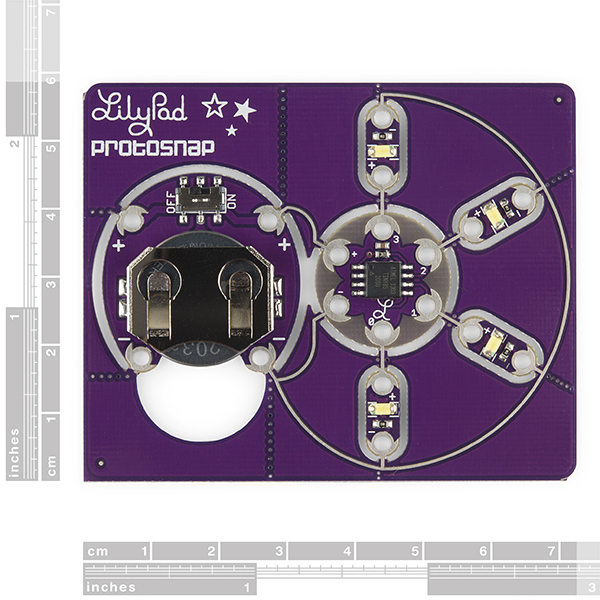 The code used for the LilyTwinkle can be found in the LilyTiny/LilyTwinkle GitHub Repo here => https://github.com/sparkfun/LilyTiny_LilyTwinkle/blob/master/Firmware/LilyTwinkle/LilyTwinkle.ino . You can reprogram the ATtiny85 on the board if you have a AVR Programmer and adapter. Try looking at these instructions for more information [ https://learn.sparkfun.com/tutorials/re-programming-the-lilytiny--lilytwinkle ]. What modifications would one make to a garment's care instructions when modifying it to include stuff like this? In other words, if you take a T-shirt, and then sew one of these sets into it to add a twinkling light effect to whatever the T shirt design is, then what would the care instructions tag be? Remove battery before washing. Machine wash warm, gentle cycle, air-dry - do not tumble, do not dry clean ? Very close. DEFINITELY remove battery, and I'd also change it to hand-wash. If you're machine-sewing your traces, the stitching will be secure enough for machine washing, but it's rough on the components, and will put too much strain on the connections between traces and components, which have to be hand-sewn. PS- Would LOVE to see what you're making! One of the comments for the white LEDs say "You can definitely run these without a LilyPad. But note that the forward voltage on these white LEDs is 3.3V, so your power supply will need to be higher than that." 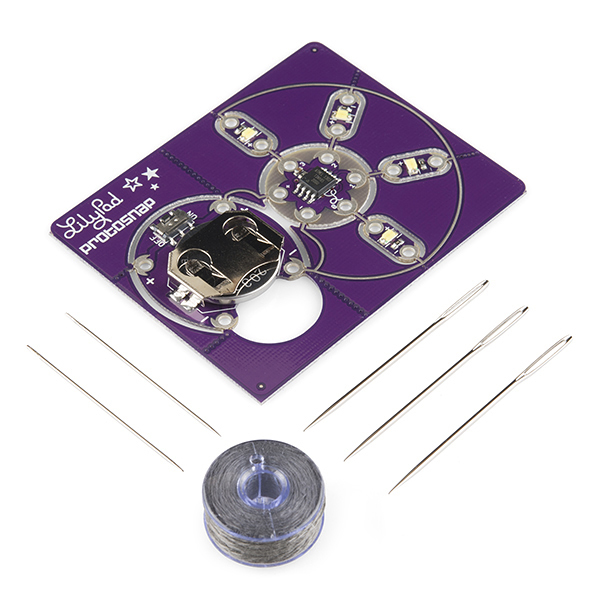 How does the ProtoSnap - LilyTwinkle work with a 3V coin cell battery if the LEDs require more than 3.3V power supply? That comment is not entirely accurate. An LED's forward voltage is far more of a curve than that of, say, a zener diode. Specifically, if you check out the datasheet for the white LED used in on the LilyPad board and scroll down to page 3, you'll find a current vs voltage graph there. You can see there that it'll work at 3V, but instead of about 20mA current you get 10mA current. According to the graph next to it, the relative luminous intensity vs current one, you'll see that they claim it will basically be about half as bright. Thanks. So I need to first find the current I want and then find the forward voltage in the datasheet graph. Then I can calculate the resistor value. Since the resistor on the LED board is known to be 100 ohm, I will have to find which current and voltage pair that give a 100 ohm resistor. Correct? 3 mA give approximately 2.7 V forward voltage according to my interpretation of the diagram. This give (3-2.7) V / 3 mA = 100 ohm resistor. So this means that when the battery (actually the AVR output pins) are at 3V, the LEDs get 3 mA given this LED datasheet and the 100 ohm resistor. 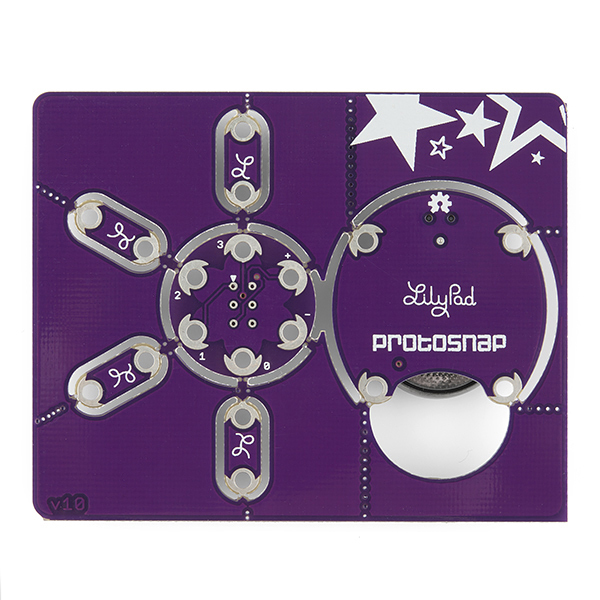 The "Proto" in "Protosnap" is meant to convey that you can fully test out your circuit before snapping it apart to be sewn into a project; something that's difficult to do otherwise. And sorry that the ISP pins aren't easier to use; it was a tradeoff against getting the board this small. Tip: sewing the board in chip-side down makes the programming pads easier to access, and using a pogo adapter makes it a piece of pie. Cake. Your choice. Just a note, the E-Textile Basics link in the Documents section doesn't work. It works here, are you still having issues? Yeah, it's pretty radical. I used this to add blinking lights to a winter hat for my daughter as a first e-textiles project, and it was seamless. The battery lasted several hours (an entire "Zoo Lights" trip at the Denver Zoo) with 8 leds hooked up (4 white and 4 blue). The pattern is subtle, sometimes, not terribly fast, and dozens of people did a "double-take" and stopped to ask me about it. It's also not terribly difficult to reprogram using an Arduino Uno (or Red Board, or USBTiny ISP, etc. ), so you can definitely get a lot of miles out of the ATtiny85 on board. Purple is best.